Following today’s (Friday 12 June) announcement by the IPCC the Orgreave Truth and Justice Campaign (OTJC) and the NUM will be hosting an open press conference at noon in the NUM main hall at 2 Huddersfield Road, Barnsley S70 2LS. Press and public all welcome. Light refreshments available. 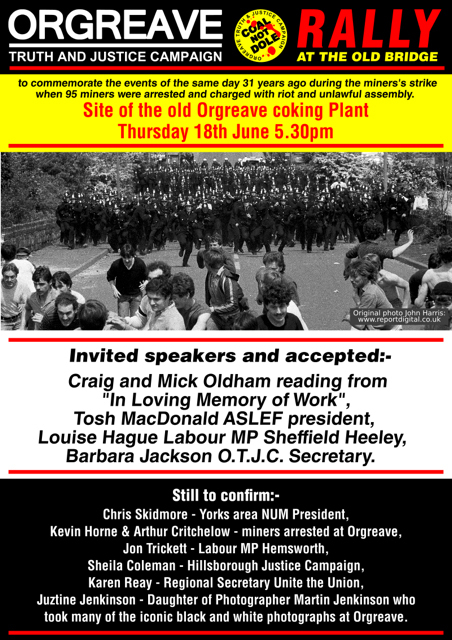 Members of the audience will include miners present at Orgreave on 18 June 1984. They will be available to answer press questions afterwards.The following will each make a short speech at the press conference and after which there will be an opportunity to ask questions. PRIORITY will be given to questions from members of the press, who should identify themselves to Mark Metcalf (07952 801783) by signing the press entrance form that will be available at the entry to the main hall. 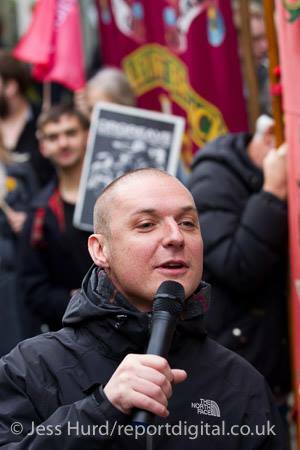 The conference will be chaired by OTJC chair Joe Rollin. 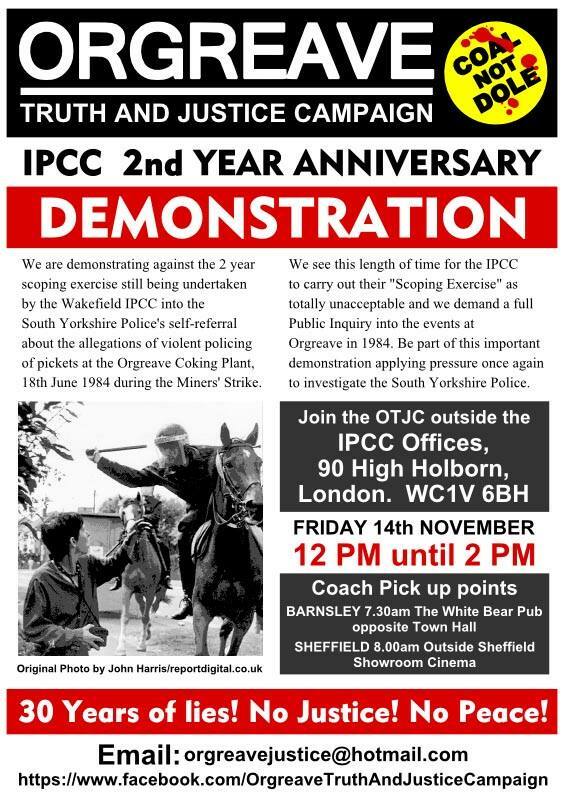 Whilst disappointed, OTJC members are not surprised that the IPCC will not be conducting a full investigation into policing at Orgreave on 18 June 1984. It was back in November 2012 that South Yorkshire Police referred itself to the IPCC, which ever since has acted slowly and conducted little independent work in assembling and collating information. 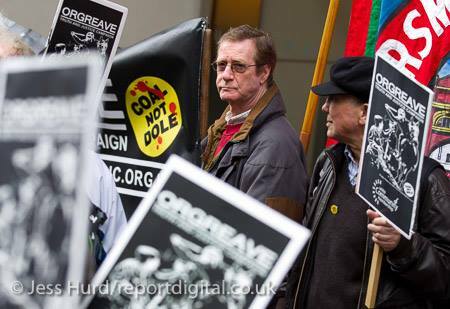 The fact that the IPCC, described – rightly in our view – by many prominent individuals as ‘not fit for purpose’, is stepping aside on Orgreave affairs will not therefore be deterring the OTJC from continuing its campaign. OTJC notes that the IPCC itself recognises in its report the limitations of what the organisation can do and that only a Hillsborough style public inquiry can eventually get to the truth. The OTJC continues to gather increasing support from organisations and individuals for a full public inquiry into why it was that on 18 June 1984, 95 miners were arrested at Orgreave after thousands of police officers – many in riot gear, with others on horseback – brutally assaulted miners participating in a strike aimed at defending jobs and mining communities. An inquiry will help reveal exactly why, when the subsequent court cases took place, all of the charges, including riot were abandoned. It must inevitably lead to two things. Some officers being charged with a series of offences – assault, perjury, perverting the course of justice and misconduct in a public office. Secondly, a paper trail that would indicate that the actions of the police at Orgreave were influenced by political pressure from within the highest ranks of the Government of the day. THE FIGHT FOR TRUTH AND JUSTICE GOES ON. 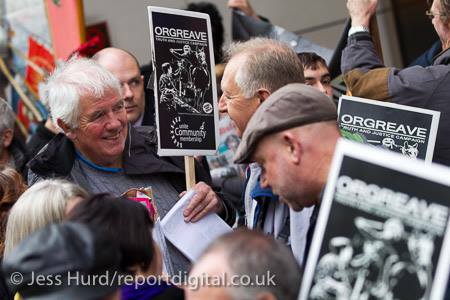 Come to the 31st anniversary rally on Thursday 18th June at 5.30pm at Orgreave. The IPCC will publicly announce whether it will be conducting an investigation into events at Orgreave in 1984 at 0.01am on Friday 12 June.At 12 noon of that day the Orgreave Truth and Justice Campaign and the NUM will be hosting an open press conference in the NUM offices at 2 Huddersfield Road, Barnsley S70 2LS. The press and public are invited to attend this conference and there will be light refreshments available. 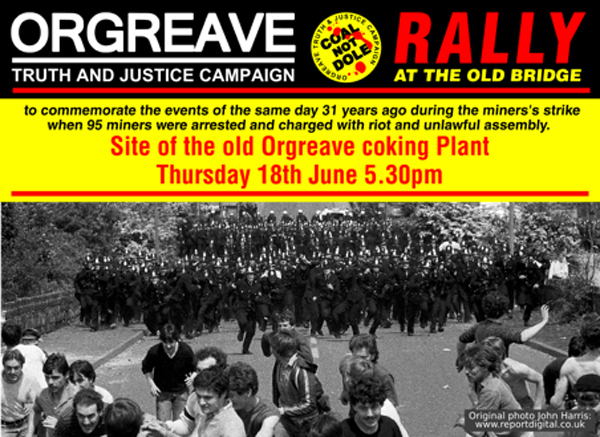 Members of the audience will include miners present at Orgreave on 18 June 1984. They will be available to answer press questions afterwards. The following will each make a short speech at the press conference and after which there will be an opportunity to ask questions. Priority will be given to questions from members of the press, who should identify themselves to Mark Metcalf (07952 801783) by signing the press entrance form that will be available at the entry to the main hall. Light refreshments available we encourage as many of our supporters to attend this event. 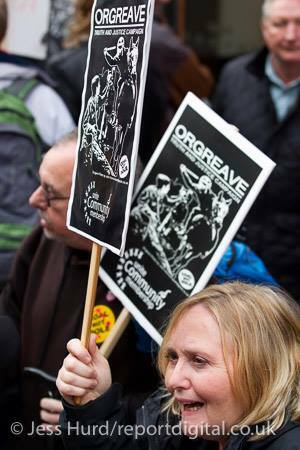 The Orgreave Truth and Justice Campaign (OTJC) is holding a rally at Orgreave on 18 June, the 31st anniversary of the Battle of Orgreave that took place during the year long miners’ strike in 1984-85. Recollections of 18 June 1984 will be combined with an update on the struggle by the OTJC for a public inquiry. 95 miners were arrested at Orgreave after thousands of police officers – many in riot gear, with others on horseback – brutally assaulted miners participating in a strike aimed at defending jobs and mining communities. However when the subsequent court cases took place all of the charges – which included, in many cases, riot – were abandoned when it became clear that the police’s oral and written evidence was unreliable. Each prosecution had been supported by two police officers making near-identical statements. 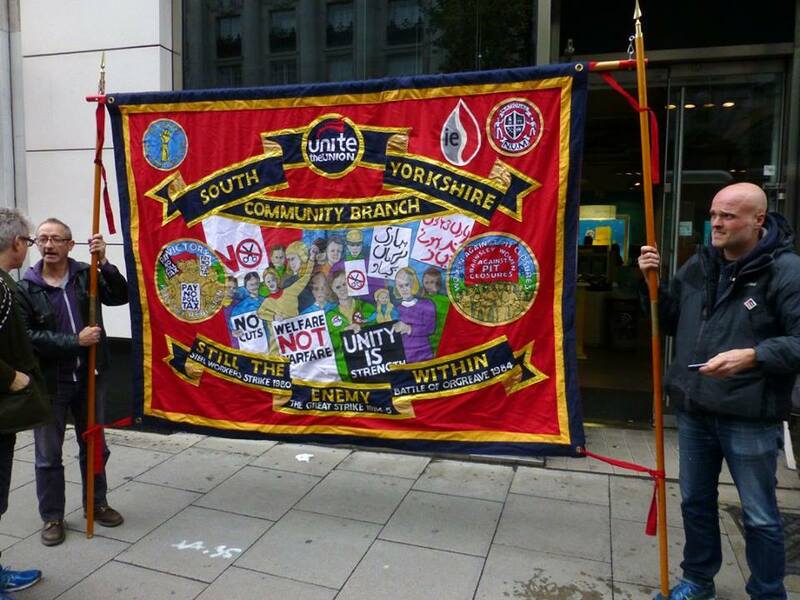 Later, South Yorkshire Police (SYP) paid out £425,000 in compensation to 39 pickets in out of court settlements. Nevertheless, no police officers were disciplined for misconduct or charged for the injuries they caused to those they attacked. It was in November 2012 that SYP – already under pressure following the release of the report by the Hillsborough Independent Panel that has led to fresh inquests into the death of 96 Liverpool fans – referred itself to the Independent Police Complaints Commission (IPCC) to decide whether there should be a full investigation into what happened at Orgreave on 18 June and in the earlier picketing at the plant in May/June 1984. The IPCC has had over 2.5 years to conduct an investigation exercise. Earlier this year the OTJC was informed that the police watchdog’s report was now completed and could be examined BUT only if the OTJC agreed to be bound by strict terms of confidentiality. OTJC refused the IPCC’s offer and has stated the conditions are “effectively a gagging order where a small number of our members would obtain information they cannot discuss with other members and more widely with the many other people who support our work. The rally at the Old Bridge, Top End, just off Handsworth Road, S13 9NA will commence at 5.30pm on Thursday 18 June. To commemorate the events of the same day 31 years ago during the miners’ strike, when 95 miners were arrested and charged with riot and unlawful assembly. Craig and Mick Oldham reading from ‘In Loving Memory of Work’. 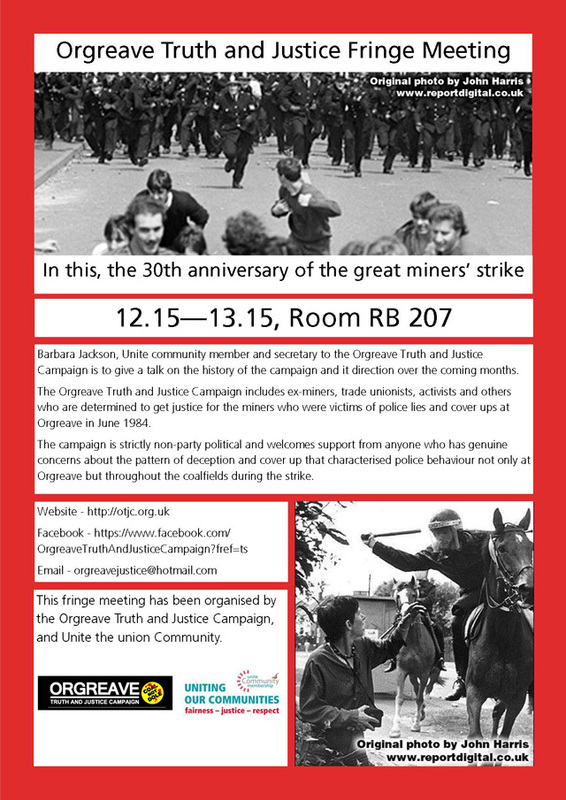 Barbara Jackson, Unite Community member and secretary to the Orgreave Truth and Justice Campaign, will be speaking at fringe meeting at the Regional Labour Party Conference on February 28th. Please see the flyer below for details. In 2012 The Miners Rugby League Football Club was formed at Ashington, Northumberland and broke new ground by playing in the North East Regional League and so became the most Northerly Club in England. The Club paid homage to the Regions rich mining heritage of Northumberland the shirts depicted the names of the 70 Collieries incorporated into The National Coal Board on Vesting Day 1947. Sadly as we know there are no Northumberland collieries left today? The shirt also paid reference to the miners who gave up their lives to the mining industry which was poignant in the year of the 150th anniversary of the New Hartley Pit Disaster. The Shirts were based on Featherstone Rovers traditional design of Navy Blue and White hoops chosen because the Yorkshire Club was from the true heartlands of the mining communities. Once again the Colliers and Miners were linked by the common bonds of Rugby League and Coal Mining. In 2014 the Club marked the anniversary of the Miners strike of 1984 by changing the initial design to incorporate the names of 85 Collieries that were closed in Durham, Northumberland and Yorkshire since the end of the strike and the devastation caused to the mine working communities. 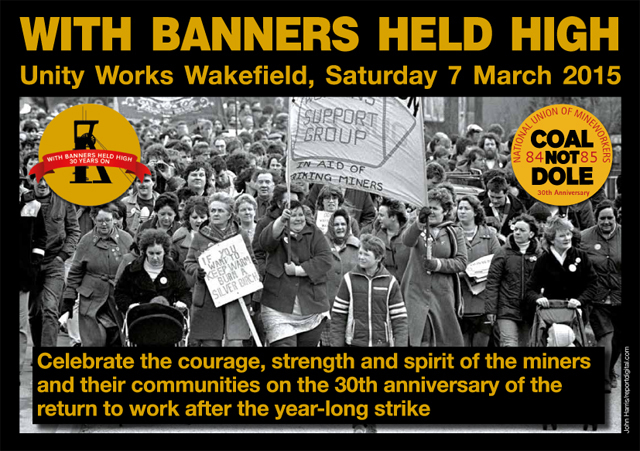 Orgreave was poignantly added to reflect the sacrifices made by the miners to protect their communities. 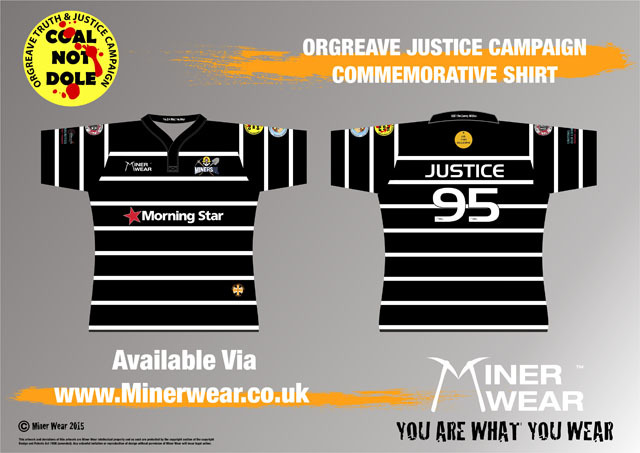 The shirt had the logos of The National Union of Mineworkers and The Orgreave Truth and Justice Campaign alongside Woodhorn and Straw Johnny who had given support to the Miners Rugby League team. What was to become apparent was the continued struggle by members of The Orgreave Truth and Justice Campaign to clear the names of the miners arrested on the picket lines at the coking plant. To support the campaign Miner Wear is to produce a shirt to help raise funds for the continued campaign for Justice. The shirt will be in black and white to represent the seams of coal and the names of the miners seeking to overturn their sentences will be incorporated in the white hoops of the design. As well as the Coal not Dole logo Graham Murdie the designer has collected together the logos of the NUM, Unite the Union and The Morning Star who have all showed continued support for the mineworkers struggle. Hopefully attention will be drawn to the campaigns to save the last three remaining deep mines at Kellingley, Thoresby and Hatfield that will see the end of coalmining in this country. The legacy of Thatcherism still remains inherent in the Government of today. The shirts will be available to pre-order on the 11th February 2015. Customers are advised to allow 3-4 weeks for delivery after payment is received. These will be available via our website http://www.minerwear.co.uk/ we accept Paypal via the website or customers who wish to pay by bank transfer or postal order are advised to email us before placing an order so we can arrange this. Shirts are priced at £50.00 +5.95 delivery (Delivery cost may increase when ordering more than one shirt). This Poem was Written by the Daughter of a Unite Community member in Sheffield. She is only 12! I scoff down my breakfast and run out the door. I head to the plant as fast as I can. But everything’s not going according to plan. 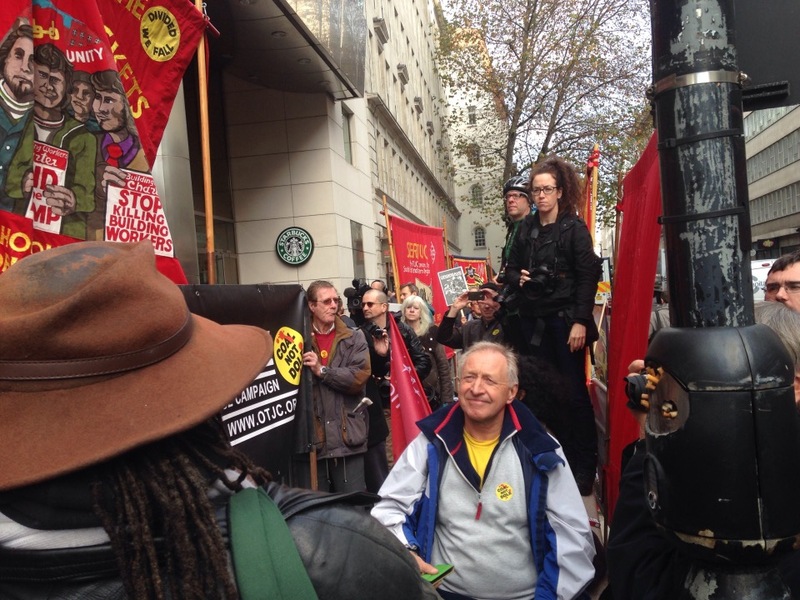 The police arrive, as Thatcher told them. Marched us to a field, over 6000 men. We stand, we sit, we lie on the ground. We’re waiting to hear from our Union bosses. The police run this way. And a handful of wives. We fear for our lives! A mounted police man preparing to strike. The camera clicks and he rides right by. There’s blood on his face. We try to find peace. With our banners held high. “TRUTH AND JUSTICE!” we cry. Have messed with my brain. For the sake of my brothers. And a couple of songs. And learn what went wrong. Now rots in her grave. Is the way to succeed! 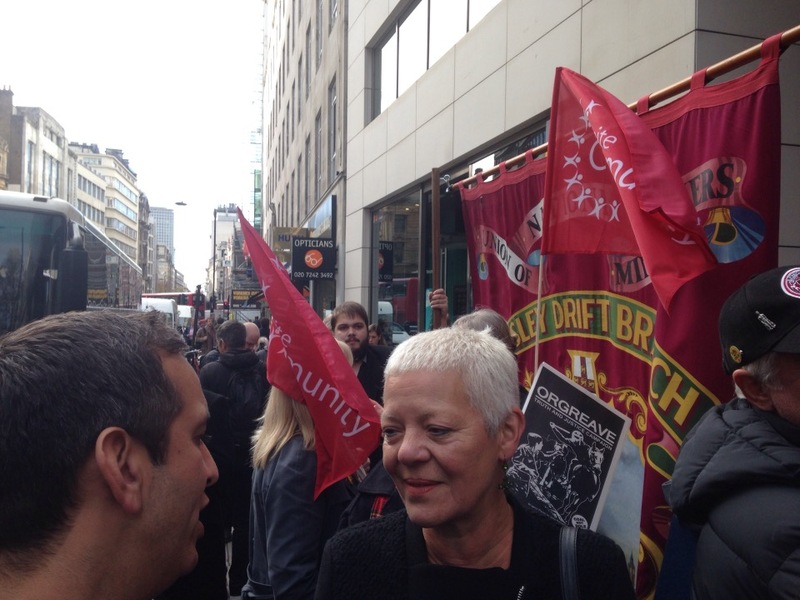 Unite Community members along with other trade unionists, marched with the Orgreave Truth and Justice Campaign, on the IPCC offices in Holborn to “express anger and dismay” that so much time has run away with no firm action by the IPCC, in organising the investigation into policing at Orgreave. Read more about the investigation here and see the photo gallery below. 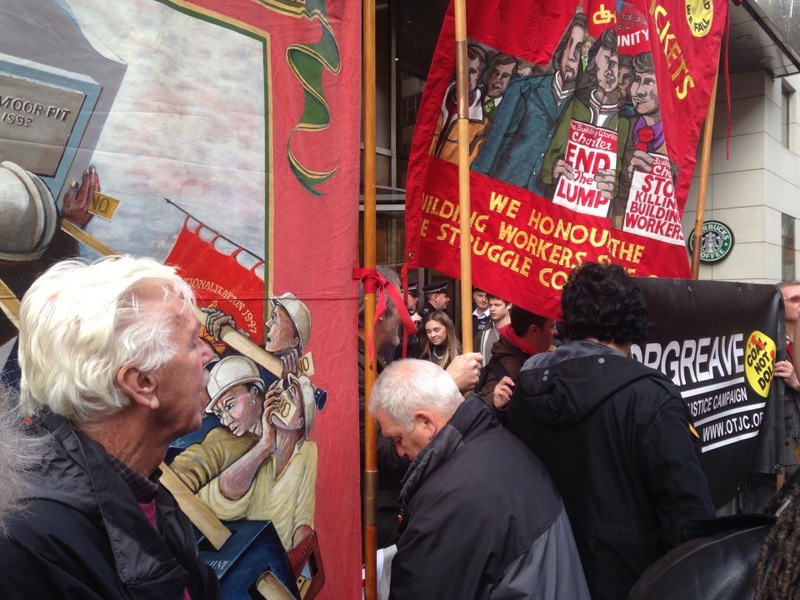 The OTJC has called for a demonstration outside the London IPCC HQ. We have already put on transport from South Yorkshire, please get in touch to book your seat and lend your support! No Justice! No Peace!